Nature-lovers Haliotis know as a group of marine whelk of shellfishes (form sort of the molluscs Haliotis) with a flattened shell which reminds a low disperser rather, what prolate spiral. By the muscular leg of Haliotis firmly pins the shell against the surface of stone, rescuing the same itself from predators and energy of waves and even can hold out on a stone during an ebb. 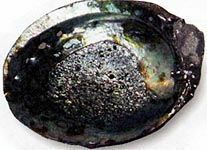 In language literature Haliotis name "abalone", however in many languages of the world these shellfishes are known as sea-ear. 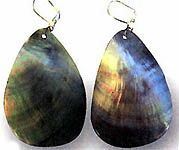 Jewellers use the term of abalone for denotation of unusual mother of pearl of marine sea-ear (ormer). 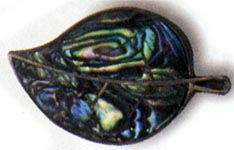 It differs riches of tints of colouring and often used for making of inexpensive jeweller decorations. In Japan to molluscs sea-ear a consuetude is related to attach to the gifts the small flat paper-cones built from a paper (carry). The roots of this tradition go away to IX century. Already then in Japan (Asia) it was accepted to do symbolic gifts gods, wrapping the dried up strips of fish or meat of sea-ear in a white-red paper. Then the real meal was transferable the strips of yellow paper, and carry grew into clean character. Until now carry images remind a little paper-cone which the piece of yellow paper peeks out from. The shell of molluscs sea-ear is associated with kind thoughts and wishes.